See a Russian Cargo Ship Launch & SpaceX Dragon Arrival Wednesday! A Russian Progress spacecraft is seen on approach to the International Space Station in this undated NASA image. A robotic Russian cargo ship will launch toward the International Space Station early Wednesday (Feb. 22), to be followed hours later by the arrival of an unpiloted SpaceX cargo ship at the same cosmic destination. And if you're an extreme night owl (or early bird), you can watch all the space action live online. 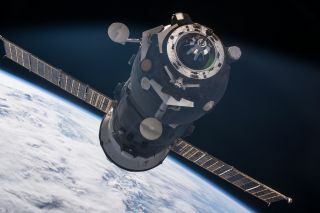 The Russian Progress 66 resupply ship will launch to the space station from Baikonur Cosmodrome in Kazakhstan at 12:58 a.m. EST (0558 GMT), beginning a two-day trip to the space station. Then, at 6 a.m. EST (1100 GMT) Wednesday, SpaceX's 10th Dragon cargo ship will arrive at the space station to complete a trip that began with a spectacular launch Sunday (Feb. 19). You can watch both space events live online, courtesy of NASA TV. The Progress 66 cargo ship's launch webcast will begin at 12:30 a.m. EST (0530 GMT). NASA's coverage of the SpaceX Dragon's arrival at the space station, meanwhile, will begin at 4:30 a.m. EST (0930 GMT) and likely conclude after astronauts on the station capture the Dragon capsule with the outpost's robotic arm. NASA will resume coverage at 8:30 a.m. EST (1330 GMT) to show live views of Dragon being attached to the space station, NASA officials said in a statement. Progress 66 is unpiloted cargo ship packed with nearly 3 tons of food, fuel and supplies for the Expedition 50 crew on the space station. It is Russia's first cargo ship launch since the loss of the Progress 65 supply craft on Dec. 1, 2016, NASA officials said. If all goes well with the launch, the new cargo ship should arrive at the space station in the wee hours of Friday (Feb. 24). Nearly 5 hours after the Progress 66 launch, SpaceX's latest Dragon space capsule will arrive at the space station. SpaceX launched the Dragon capsule Sunday using a Falcon 9 rocket that lifted off from NASA's Launch Pad 39A. It was the first private rocket launch from the historic pad, which NASA used to launch the Apollo 11 moon-landing mission and the final space shuttle flight, among others. Dragon is carrying about nearly 5,500 lbs. (2,500 kilograms) of food, scientific equipment and other supplies for the space station crew.